Oh my sweet mercy, I can't believe that tomorrow is Christmas Eve! 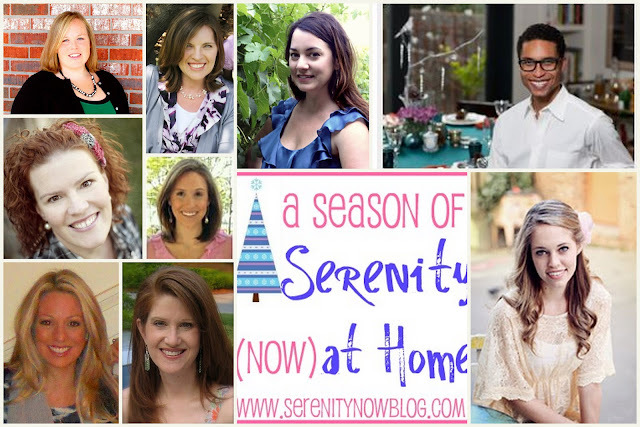 Hosting this series, A Season of Serenity (Now) at Home, has been so much fun. I wanted to take today to thank each blogger again, and also to share a few fun Christmas Pins from my Pinterest Page. It's never too late for a little Christmas Inspiration! December has really flown by for me. I've certainly had a few melt-down moments (Christmas Tree Lights Drama, anyone? ), but hosting this holiday series has been so helpful for me. Not only have I had a chance to learn some creative tips and tricks...I personally benefited from hosting some gracious and talented bloggers here. Knowing I didn't have to stress about coming up with new post material every single day took such a load off of my shoulders. I can say with complete certainty that this Christmas season has gone more smoothly because of it. Many, many thanks to you, Kelli, Richella, Becky, Kate, Beckie, Michaela, Megan, Michelle, and Courtney! I know series and guest posts aren't always a hit with readers. Thank you, readers, for your patience with me as I took this month to enjoy some special holiday time with my family. I hope you enjoyed this series. Thanks to everyone of you who took the time to comment, Tweet, or FB the links. Have a Merry Christmas, if I don't "see" you before then. Merry Christmas to you and your family. I hope you have a wonderful time celebrating. Love the House of Smiths living room at the top. So pretty! That is an awesome and Merry Christmas! I love the designs and the motif if course.